Thank you for taking the time to move your courses towards compliance. For the Fall of 2017, all new materials used, built into, or added to a course that contains electronic information needs to be accessible compliant. By 2020, all electronic materials in courses need to be compliant. This may appear at first to be a daunting task but the resources below will provide guidance and offer solutions. What campus resources are available to ensure Electronic Information and Technology is accessible? For information about trainings on accessible technology, please visit the Center for Teaching & Learning’s workshop calendar and the GROW with Marquette calendar. Please note that GROW sessions for accessible technology are listed under the IT Office Training tab. You can also contact the Center for Teaching & Learning and the Office for Students with Disabilities for more assistance. Should the Office of Disability Services notify you that a student with a sensory impairment has enrolled in one of your classes, the Office of Disability Services will assist you in making the necessary changes to your course material to ensure the student will be able to access your curriculum. If you are preparing documents to comply with the University’s EIT policy, but are not working with an identified student, the Center for Teaching & Learning can assist you in making these materials more accessible. 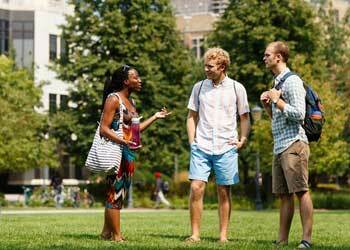 Begin with Marquette's Accessibility Checklist. Note that the D2L platform itself is accessible, but the content you upload into it might not be (see the checklist above; and links below about images, documents, videos). Raynor Memorial Libraries is committed to making its resources, services, and facilities accessible to everyone in the Marquette community. For specific information that applies particularly to STEM courses and accessibility, please see the following. See below for other information related to different technologies. Siteimprove is an online website quality assurance tool currently deployed for sites on the marquette.edu domain. The software automatically reviews public-facing websites, similar to a search engine, and generates reports that identify accessibility issues. These reports are then emailed to the site’s registered content manager. If you need help working with your Siteimprove reports, or need access to your site’s report, contact Jan Harwig via email in the Office of Marketing and Communication. This free Chrome browser extension analyzes any web page, including restricted web pages, for accessibility issues. The Chrome extension and Firefox Add-on find the most obvious accessibility issues on a web page. For content not covered by Siteimprove, the WAVE Accessibility Evaluation Tool may be an option. The WAVE Accessibility Evaluation Tool checks for any accessibility issues of websites that you’re using in your courses. Enter your page’s URL on the site, and the tool evaluates the page and provides suggestions for improving accessibility.